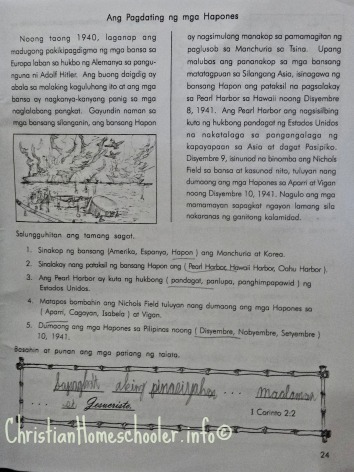 Our homeschooler’s lesson in Araling Panlipunan today is about the Japanese Era and the Death March. 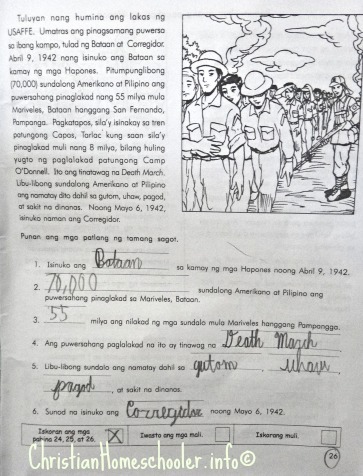 After he has gone through the pages of his PACES, our son paused with a bothered look on his face and told me details about the horrific experiences of the American and the Filipino men during that time. This lesson is actually a continuation from yesterday’s. And while I was listening to my son telling me how the people suffered in the hands of the Japanese people when they colonized the Philippines in the 1940’s, I was reminded of the stories of my grandfather when he was still alive. I told my homeschooler some of the stories that Lolo Moises told us when he would come and visit our place. I had to do away with the manual clamping systems they used to torture people, the bayonetta they used to kill the children. Oh those were horrid! I cannot help but feel the same way I felt when those stories where first told to us. He was such an animated storyteller. His stories back then made me realize how fortunate we are that we do not have to live to witness such sad times of our history. Our son cannot help but take pity on the circumstances of the people that had to go through the cruelty of the Japanese people back then. He kept on saying that the Japanese people should not have come to our place and hurt our people. As I was listening through our 7 year old’s sentiments, I had to come up with an explanation that would have him not generalize Japanese people. Because he was starting get to the point where he was already not liking anything that has to do with Japanese. I had to explain to him that it was a time of war and the choices that the Japanese people made during that time are not the choices of the current generation. There are wars that are just, most of them are not – like the Japanese War. And war is always a result of sin. I love that our son is getting into our country’s history. What makes it more fulfilling for me is how he can thoroughly understand and is even improving his comprehension skills in Filipino. There are still words that he would come and ask from time to time for but he is getting better at it by the day. It is a good thing that even if the School of Tomorrow is an international curriculum, the Filipino and Araling Panlipunan (Social Studies) subjects are integrated in it.